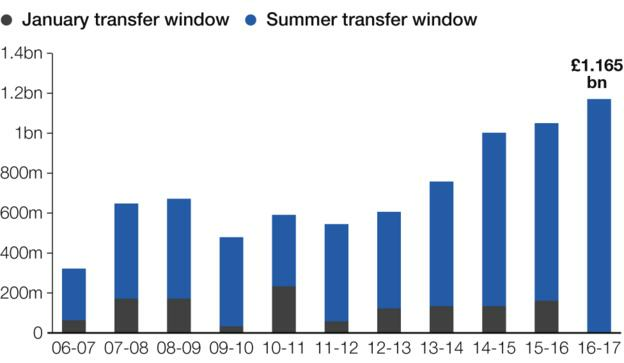 Premier League clubs spent more than £155m on transfer deadline day as the summer window outlay reached a record £1.165bn. Teams had already spent a combined £1.005bn as of 08:30 BST on Wednesday, shattering last year's record £870m. Thirteen top-flight teams broke their own transfer records. The 20 clubs in the Premier League have benefited from a record £5.1bn television deal which came into effect this season. "As has been the case for a number of years now, the increases in broadcast revenue, with the 2016-17 season being the first of the new broadcast deal cycle, is the principal driver of this spending power," said Dan Jones, a partner at financial analyst Deloitte. This graphic below illustrates the gradual increase in spending by Premier League clubs over the past 10 January and summer transfer windows.